Venus, like Earth and Mars, is immersed in a flow of charged gas from the sun. Since Venus (and Mars) doesn't have a magnetic field, gases in the upper atmosphere become charged and interact with the solar wind. Scientists think the solar wind gives the charged particles enough energy to escape and that's why Venus is losing its atmosphere. The water inVenus' atmosphere is gone with the wind, new detections suggest. Thisabsence is strange, because astronomers think Venus and Earth likely began withsimilar amounts of water since they are about the same size and formed at thesame time (some 4.5 billion years ago). Yet today, Earth's atmosphere andoceans contain 100,000 times the total amount of water on Venus. 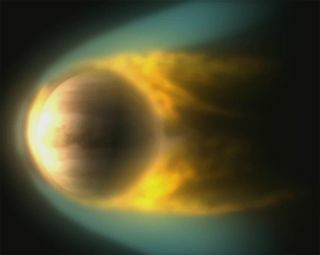 Due to a greenhouseeffect on Venus, temperatures at the surface can soar to about 870 degreesFahrenheit (465 degrees Celsius). And so the water from the planet's surfaceimmediately boils off. But its atmosphere is also relatively dry, and thequestion has been: where did that initial atmospheric water go? Magda Delvaof the Austrian Academy of Sciences and her colleagues set out to understand thiswater loss with data collected by instruments onboard the European Space Agency'sVenusExpress spacecraft. They foundevidence for the loss of hydrogen from the atmosphere on Venus'day side, or the side facing the sun. The finding suggests the solar wind, astream of charged particles from the sun, could be responsible for strippingaway the hydrogen atoms. The hydrogen may have been part of water molecules(H2O). The solarwind carries electrical and magnetic fields throughout the solar system and "blows"past the planets. Earth's magnetic field protects us from the charged stream.But Venus doesn't generate a magnetic field. There, the solar wind strikes theplanet's upper atmosphere and carries particles off into space.? Thisday-side process is responsible for about 20 percent of the hydrogen lost from Venus'atmosphere, Delva told SPACE.com, with the other 80 percent lost onthe planet's night side. Last year,Venus Express data revealed a loss of hydrogen and oxygen on Venus' night side,with twice as many hydrogen atoms as oxygen atoms escaping from the atmosphere.Since water is made of two hydrogen atoms and one oxygen atom, the detectionsuggested water was being broken up in the atmosphere. On the dayside, however, Delva and her colleagues have yet to detect any oxygen atoms,which would help seal the deal for a watery source. "I keep looking at themagnetometer data but so far I can?t see the signature of oxygen escaping onthe day side," Delva said. Comparedwith the night side, the hydrogen atoms stripped from the day side exist muchhigher in the atmosphere, at about 6,200 miles to 31,000 miles (10,000 km to50,000 km) above the surface of Venus. And there are more of them. "Theseresults show that there could be at least twice as much hydrogen in the upperatmosphere of Venus than we thought," Delva said. Theresearch will be detailed in the journal Geophysical Research Letters.